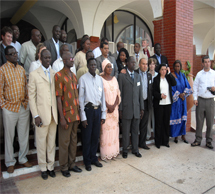 By decision BC-6/6 the Conference of the Parties of the Basel Convention in 2002, selected Senegal as a site to establish BCRC for French-speaking countries in Africa. This resulted to the establishment of BCRC Senegal in 2002. Later in November 2007, the same institution was nominated to serve as a regional centre under the Stockholm Convention. The centre was initially endorsed by the Fifth meetings of the Conference of the Parties to the Stockholm Convention for four years. Recently, COP 7 has endorsed it again for another term of four years. Expertise: ESM (environmentally sound management) of hazardous wastes and development of national plans on various hazardous waste streams including PCB wastes. The centre also aspires to serve as a reference centre for training and technology transfer in the area of ESM and disposal of POPs in the region.